We have a 24-hour emergency call service to meet your security needs at any hour of the day. When building locks are not functioning properly, give us a call and we will get your building secure and functioning properly again. We take emergency calls for anything from repairing damaged doors and panic bars to providing emergency board-up service in the event of a broken glass door or window. We work closely with property management companies to provide seamless customer service for the building owners. By managing a client database of door keys, we are able to get you a new key immediately in the event a key is lost avoiding replacing all new locking mechanisms. We are proud to be a factory authorized repair center for the biggest names in the lock industry. 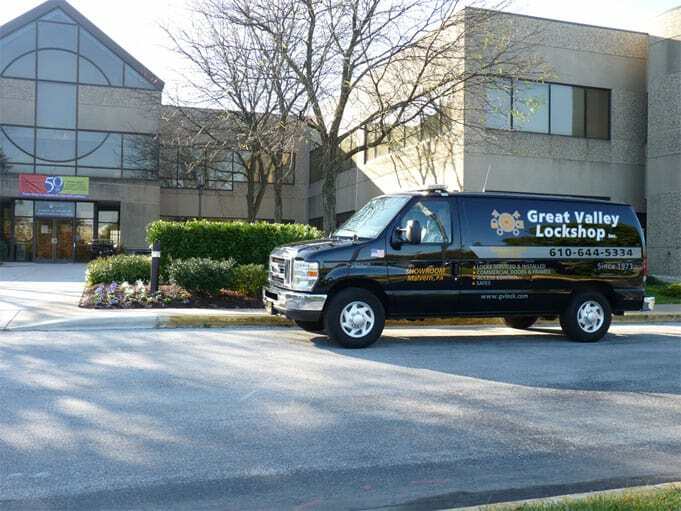 Having excellent customer service along with or high standards of business, Great Valley Lockshop is a chosen repair center for companies like Yale, Norton, Rixson and more. For companies that need their door products to have locking mechanisms installed, we can do that with a faster turnaround time than most manufacturers. Often times we’ll install the final product for the customer on behalf of the wholesale company.